Are you Prepared to deal with Pokémon Go in the Workplace? You may have heard that Pokémon is making a comeback. In its newest augmented-reality form, it may soon be invading your workplace, too. Welcome to Pokémon Go, the newest gaming trend, and also the newest hazard in your workplace. As the Pokémon Go trend grows, so too does the number of accidents that are a direct result of this immensely popular game. Car accidents, slips, trips, and falls, and even fights are being reported in growing numbers, all as a result of irresponsible game play. More important is the number of workers playing Pokémon Go on the job, creating brand-new hazards in the workplace. Workers playing Pokémon Go at work may be tempted to catch Pokémon around the office or warehouse. Pokémon have even appeared at OSG! Seel came to visit us at OSG today! OSG aims to keep workers safe. Share these tips with workers to keep them safe in pursuit of Pokémon around the workplace – or anywhere! Do not enter restricted areas, work sites, or private property—no matter how many rare Pokémon they may contain! Use a buddy system when exploring new areas: enjoy the double benefit of added safety and having more rare Pokémon appear when more than one person is roaming an area—after all, you gotta catch ‘em all! 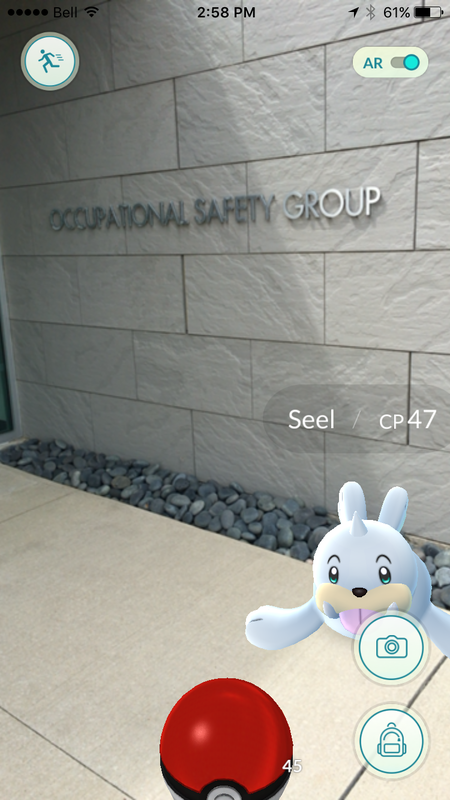 Protect your workers by making them aware of health and safety rules, policies, and OSG’s tips for playing Pokémon Go safely. Be sure to have all applicable posters and literature posted on your company’s Health and Safety Board. You may also wish to create a specific policy about using mobile apps at work. OSG is available to help you develop a policy to keep you, your colleagues, and your workers safe. OSG can do more than just keep Pokémon Go players safe. Workers in Ontario need to complete required and appropriate health and safety training. We can meet and exceed all of your training needs, and we can help you determine what training is required by law, and what training is recommended in order to ensure that you meet and exceed training requirements.